The Watergate Hotel Celebrates 50 Years! This year The Watergate Hotel, the legendary property situated in Washington, DC, celebrates 50 years as an American icon. Since first opening in March 1967, The Watergate Hotel has hosted the world’s most discerning leisure and business guests - ranging from diplomats to celebrities - and thrived throughout decades of American history gaining a reputation as one of the most recognized hotels in the world. Originally designed by Italian architect Luigi Moretti to look like a sail on the Potomac, The Watergate Hotel made waves with its groundbreaking contemporary style and came to epitomize the fabulous lifestyle and sophistication of its time. Following a $200 million-dollar renovation by its current owners, Euro Capital Properties, The Watergate Hotel reopened in June 2016 with new vibrant spaces such as The Next Whisky Bar, Kingbird, The Backroom at Kingbird, Top of the Gate, and Argentta Spa. The hotel’s current design captures the essence of the property’s retro roots, paying homage to its past while simultaneously paving the way for a new chapter to be written. • “Dive-in Movie Nights” where guests can get comfortable in a pool float while enjoying beloved films of the era, tied to The Watergate Hotel or Washington, DC. The Watergate Hotel is located at 2650 Virginia Avenue, NW in Washington, DC. For more information about the hotel, or to book one of these experiences tied to the 50th anniversary, please visit www.TheWatergateHotel.com. Following an extensive $200 million renovation, The Watergate Hotel has once again opened its doors to guests. Leisure and business travelers alike can experience the revitalized bold mid-century modern design, which blends classic elegance with the extravagance and warmth of a true luxury lifestyle hotel. 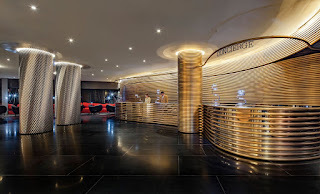 Under the ownership of international real estate developer, Euro Capital Properties, the distinguished hotel features select interiors by illustrious designer Ron Arad along with intriguing sculptural furnishings from Italian designer Moroso. The Watergate Hotel boasts 336 stylish guestrooms, including six exquisite Diplomat Suites, 24 premier suites and two stately Presidential Suites, as well as 27,000 square feet of flexible meeting and event space, including a brand new ballroom and 10,000 square feet of outdoor terraces overlooking the Potomac River. Hotel guests and residents alike can enjoy access to dining at Kingbird restaurant and its energetic bar, The Next Whisky Bar, and spectacular Top of the Gate rooftop bar and lounge with 360-degree views, in addition to the exclusive Argentta Spa and fitness facility, complete with a lavish indoor pool. The hotel is conveniently located near many of Washington, DC's most popular destinations including The John F. Kennedy Center for the Performing Arts, a mere one mile walk to The White House and National Mall, and in the near vicinity to Georgetown shopping, George Washington University, Embassy Row and the picturesque Dupont Circle. For more information, please visit www.thewatergatehotel.com. Euro Capital Properties is an international real estate developer and hospitality management company, bringing design-forward properties such as The Watergate Hotel to major cities around the world. Headquartered in New York, the company's principal has developed and managed iconic properties in Paris such as L'Hotel du Collectionneur with Euro Capital Properties' sister company, The Gate Collection. A strategic partnership remains with the Paris properties.